Or view larger version. Last West. 1938. Dorothea Lange, photographer. Gelatin silver print. Collection of Oakland Museum of California. Gift of Paul S. Taylor. 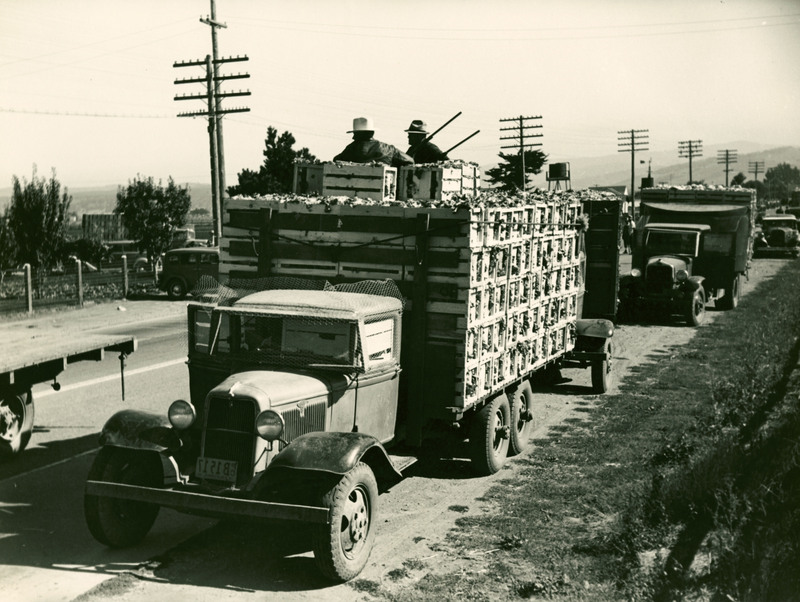 "September 15, 1936, a convoy of large trucks filled with lettuce rolls through the center of Salinas, California. The road sides are filled with crowds of agitated pickets belonging to the Fruit and Vegetable Union…. Tensions are high, the fuse is lit and the situation explodes. The pickets let fly a hail of stones, bottle, and bricks toward the trucks. Growers protecting the trucks return fire with tear-gas…police officers wielding clubs and ax handles attack the crowd." Prior to the Great Depression, Mexican American and Asian Americans were viewed by agribusiness and farm owners in California and elsewhere in the U.S. as laborers who would accept the worst conditions and lowest wages. Nevertheless, Filipino lettuce workers in Salinas organized one of the first California farm labor unions in 1933, and in 1934 led the first of several strikes against lettuce growers in Salinas with no assistance from powerful, organized white labor unions. This first Filipino union grew into a multi-racial coalition of Filipino, Mexican, and white workers, which was broken by the advent of World War II.